Another night of spontaneous plans, same cast as the night before, but a different venue – Rybread’s house to be exact. I had loudly praised the awesomeness that is Settlers of Catan (Settlers in short for those in the know) to Bee many times and each time she listened with a skeptical ear. Fast forward to a recent board games night and Bee finally understood why I’m so hooked on this game! This time we introduced Jan to it and he was similarly hooked. We played into the wee hours of the morning and it still wasn’t enough! This entry was posted on February 22, 2012 by debbe. 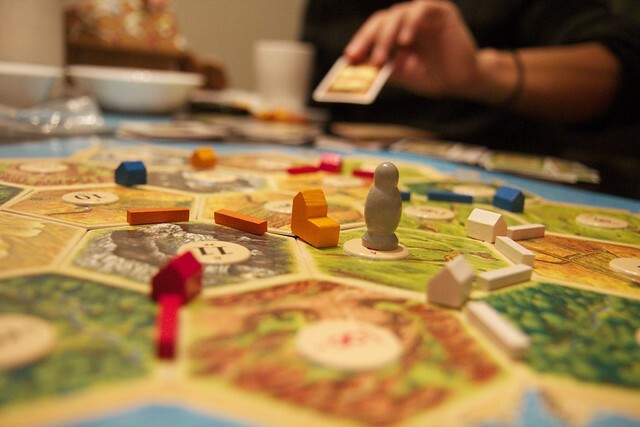 It was filed under 365, Friends and was tagged with board games, Friends, Fun, settlers, settlers of catan, spontaneous. Agreed! I love how RyBread is just taking a card in the background.